I thought we were going to get a week off, but I guess not. Toys'R'Us is running a 20% sale on Lego Friends, Star Wars, DC Super Heroes, and Duplo sets. That should help bring some of those Star Wars Microfighter sets into the affordable range, among other things. Target is also running a $23.99 sale on the following sets: 76031 Super Heroes Hulk Buster Smash, 41059 Friends Jungle Tree Sanctuary, 41097 Friends Heartlake Hot Air Balloon, 31024 Creator Roaring Power or 70168 Ultra Agents Drillex Diamond Job. They are regularly priced $29.99. I figure enough time has passed on my Survey Questions that any new answers aren't forthcoming. Here are the results. Less Than Once a Year: 12 votes (32%). Every 6 Months: 7 votes (18%). Every Other Month: 7 votes (18%). Every Other Week: 1 vote (3%). Prior to 2012 (Mechaton): 7 votes (16%). 2012 (MFZ:RA): 9 votes (20%). 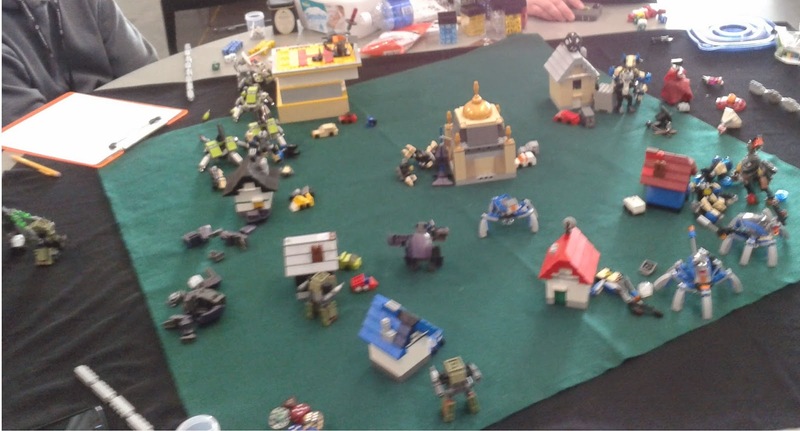 2014 (MFZ:IO): 14 votes (31%). Survey Question 4: Favorite Faction? Solar Union: 10 votes (31%). Free Colonies: 8 votes (25%). Your Own Solar Calendar Creation: 4 votes (13%). A Creation Outside the Solar Calendar: 6 votes (19%). Survey Question 5: What's Your Favorite Part of Mobile Frame Zero? The Setting: 8 votes (24%). The Rules: 5 votes (15%). 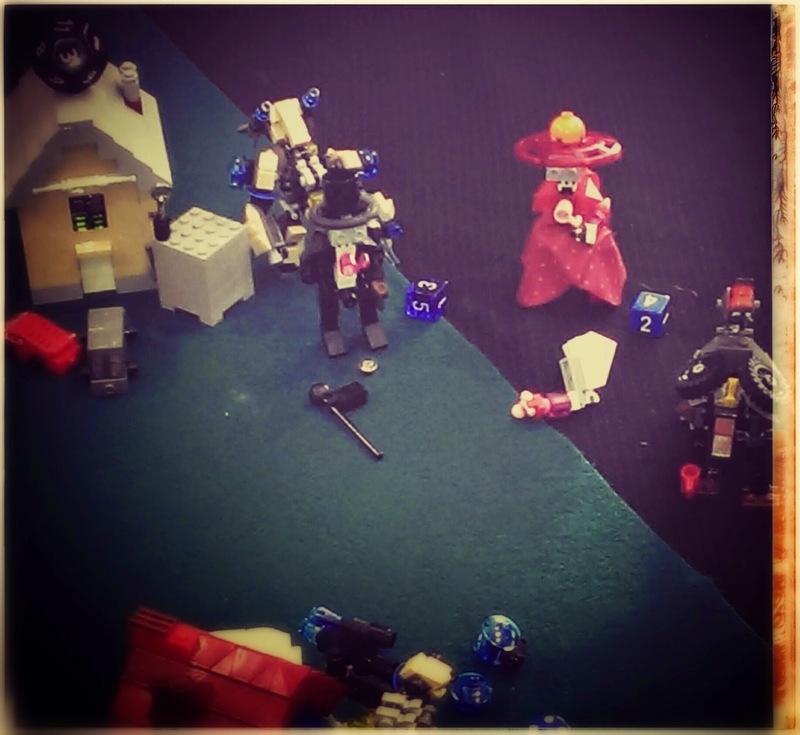 The Lego: 16 votes (48%). Special Snowflake: 4 votes (12%). I'm kinda surprised that question two got the most responses. 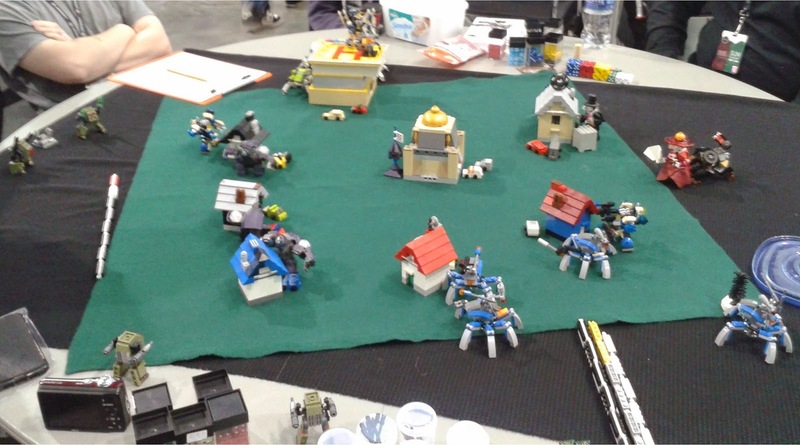 I'm not really surprised that the community skews older, or that the Lego is the favorite part of MFZ. 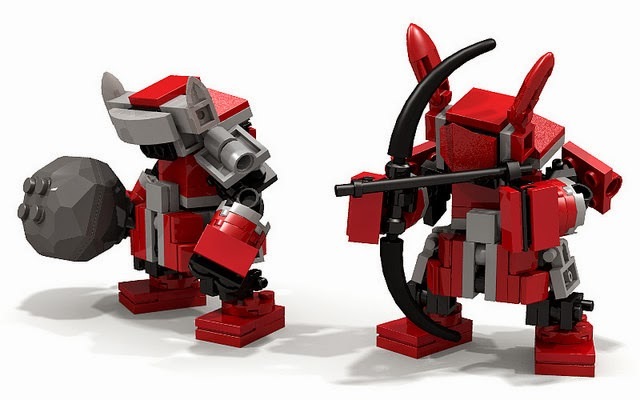 More non-human robots/frames/mecha for you to ogle. Sentrybarfs by cmaddison. A trio of simple, clean builds. 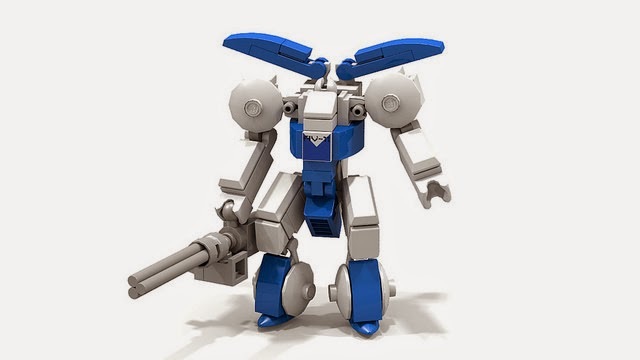 but I think it's a good size for MFZ. 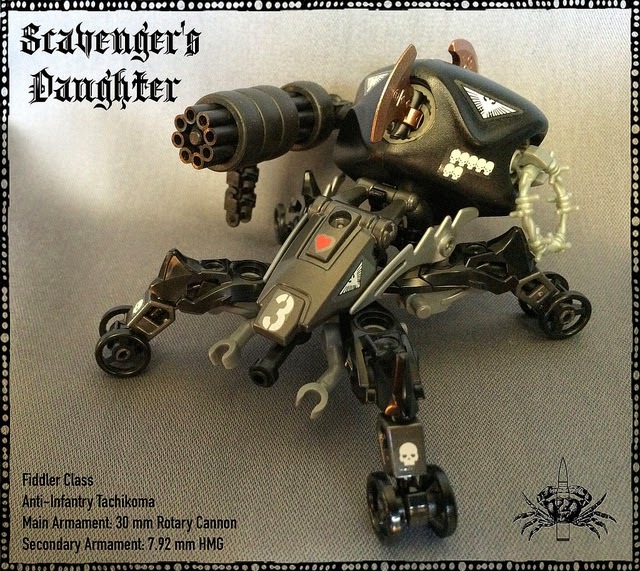 'Scavenger's Daughter' Tachikoma by dtowncracka. A very interesting set of parts choices and techniques in this build. It took me a second glance to figure out it's not quite as large as it looks. 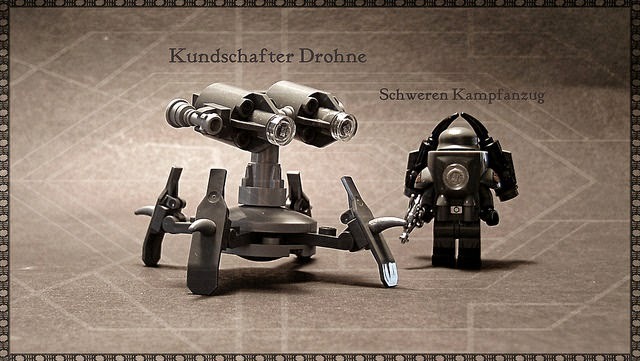 like this drone, lots of character for not so many pieces. 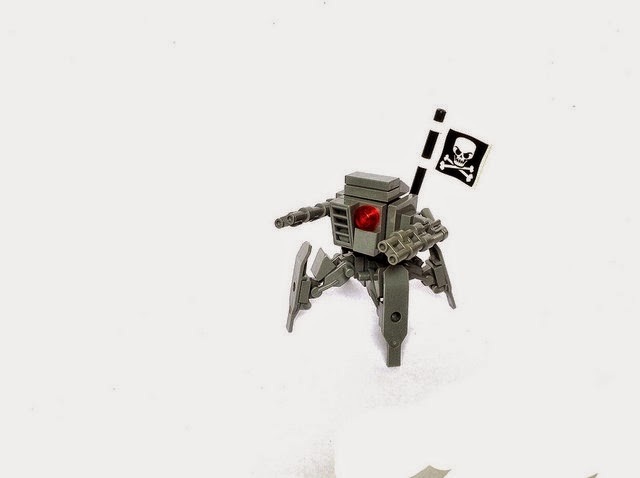 Pirate Drone by J-Sam. I like this one, it's a cute little build. 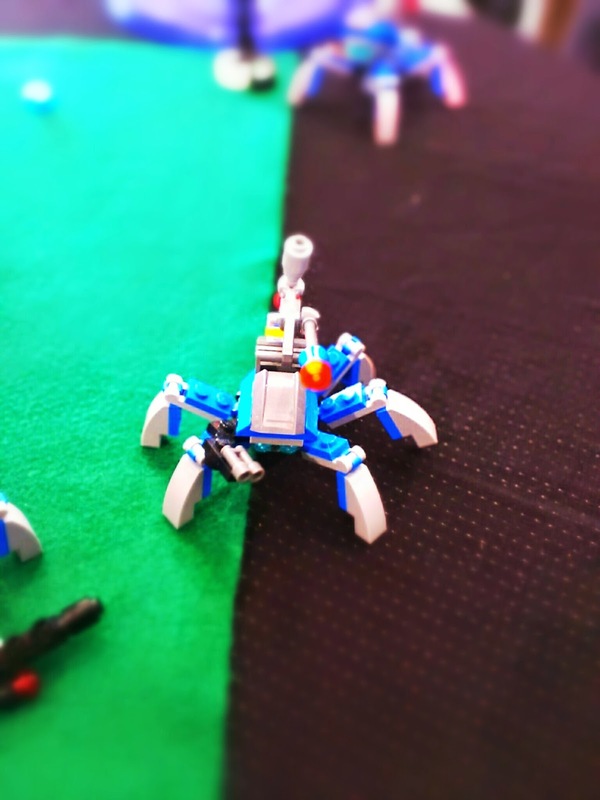 Microfig Mechas by The Mugbearer. I've featured his work here before in both Ideas posts and a Spotlight. Type 3 Mecha from this submission would be right up our alley. Box Bot by Beitle. I think this deserves to be doing a lot better than it is. Steel Brothers - Steel Blade by polinozs. This is a fairly simple design but it has a lot of good parts. 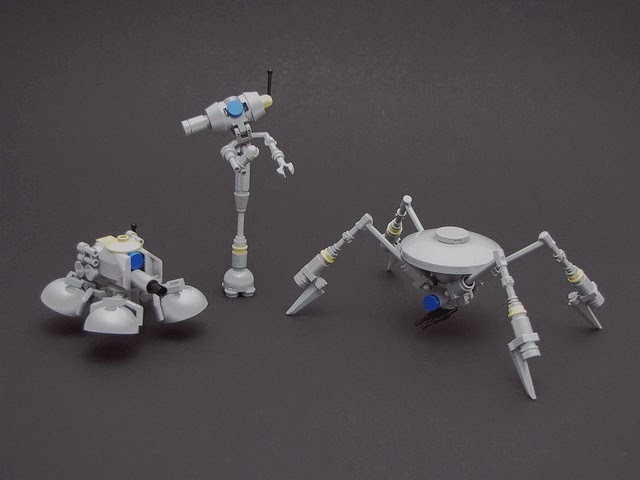 Micro Mechs - Pocket Models by BWTMT Brick. C'mon, 4P scale mechs. What's not to love? Tesla Troops by Garry_Rocks. This is a massive submission and I hope it gets a little closer to its goal. Chronos by Accelerando. One of the main complaints I hear is that Lego doesn't have any sets that are ready to go right out of the box. This was purpose built for MFZ. C'mon!! What more do you want? Three years ago today I made my first post for this blog. 468 posts and still going strong. To mention another milestone, it looks like I'll hit my 500th post sometime in the first or second week of June. Woof. That's a lot of talking for someone who wasn't sure they had something to say. Thanks for listening. This guy should be available in general retail. I've heard of it being sold at Target back during Christmas. I picked this up at Toys'R'Us. Bag. MSRP of $3.99 gets us a $0.10 Price per Piece. Minifig. The wolf helmet could make for an interesting mecha head. 2x2 Studless slopes, Mod. Plate w/Bar (open ends), 1x1 Round Bricks, Tooth Plates, 1x2 Mod. Bricks w/Axle Hole, Mixel Joints, etc. There just isn't enough of these parts. Build. 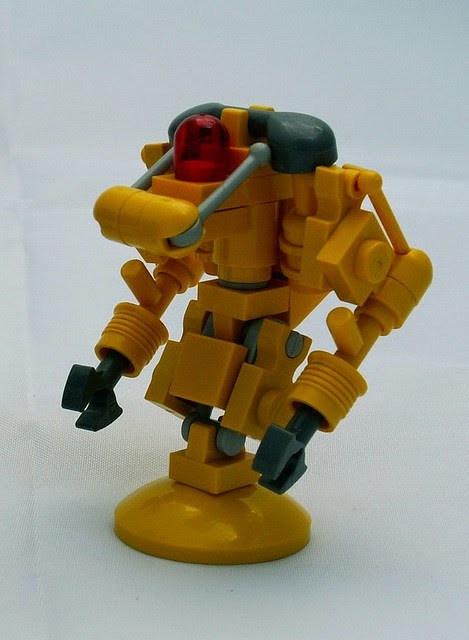 A stumpy, roughly 4P, mecha. Stats: 2Rh+d8/1Y/1Gd8/2W. Score: +5 (B+). This is the best scoring Chima polybag I've reviewed so far. Target is running a 20% off sale on the Ninjago, Disney Princess, and City lines. I'm not sure how long the sale is running, probably for a week like standard sales. There's some interesting sets in that list and some of them drop below the Golden Ratio with this sale. 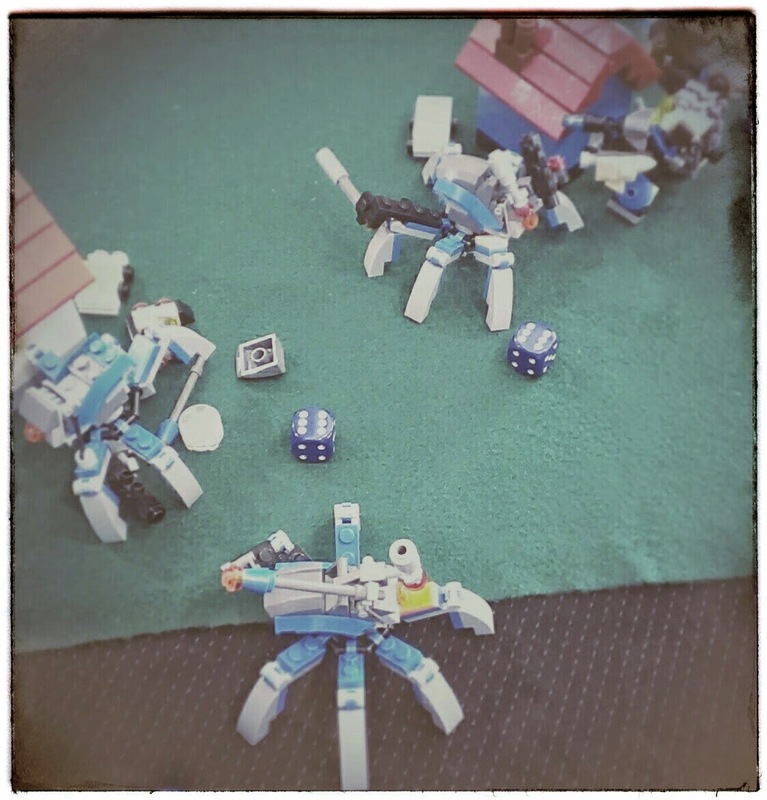 More random mechs from Flickr trawling. Salvage Drones by bermudafreze. The ones on the right are beasts. them lots of character. I love the technique used to make the hand. 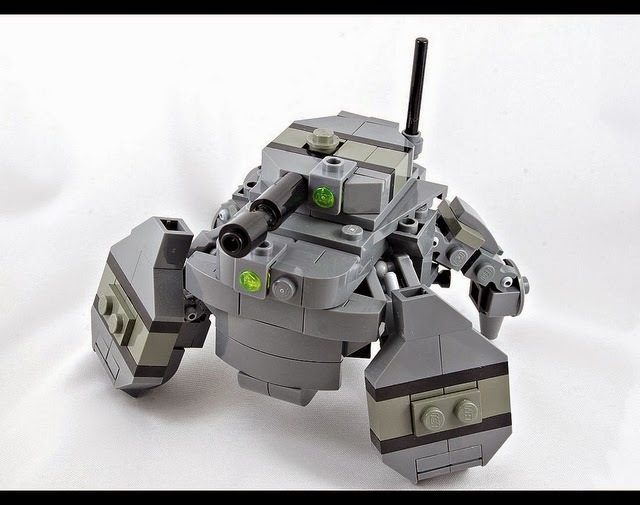 Micro Mech by Rancorbait. Render. This is a slick piece of work. love to see a squad of these on the gaming table. by his son robbadopdop. It even has instructions. I've posted a couple of survey questions over on the Hangar, mainly because I'm curious as to the makeup of the community. I'd appreciate it if you participated. I'll be posting another question on Friday (4/20) and probably another on Monday (4/23). Once I feel the questions have had enough time to run their course I will publish the results here on my blog. 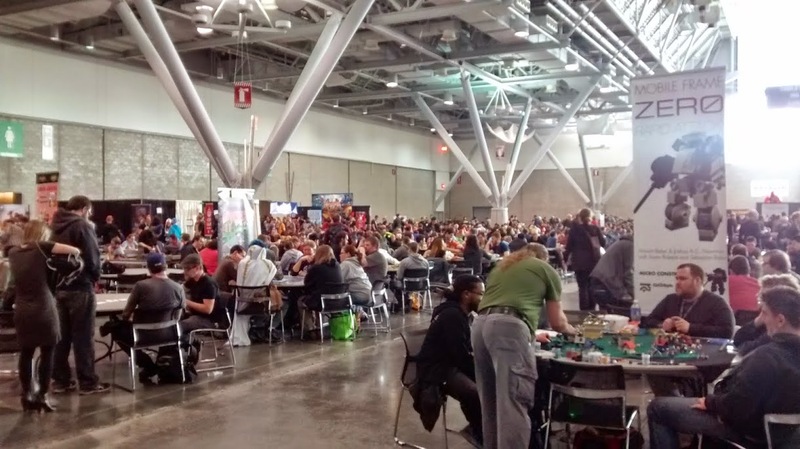 This will be the last post talking about PAX East for a while. Hopefully. :-) I'll be sharing the title of this series of posts with Dark Cloud Blogs as he was the one that came up with the title and idea. 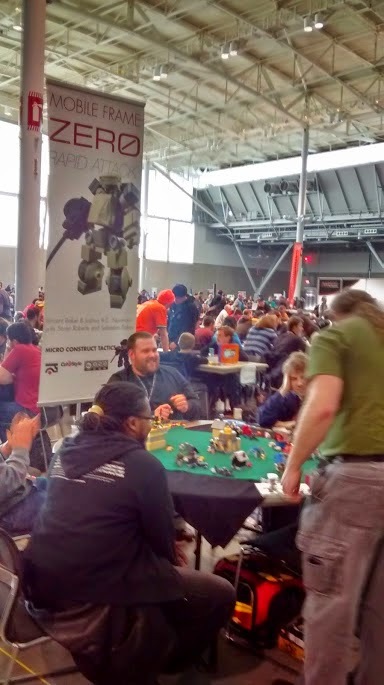 He is also the one that challenged me to a minifig scale game of MFZ at PAX East 2016. He already has an idea for what his Frames are going to be and -- I believe -- already has them assembled. 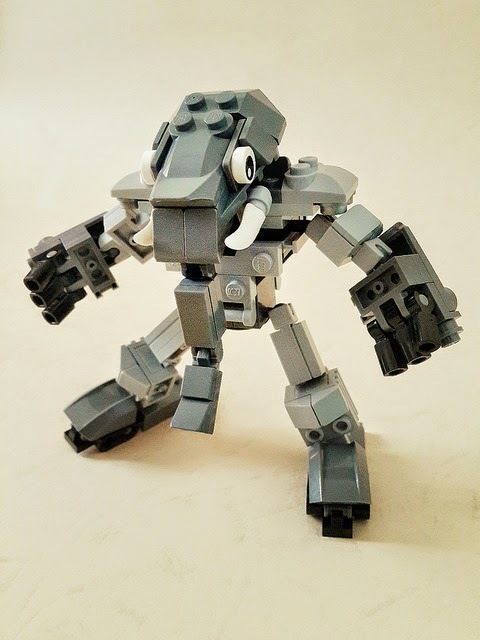 I've got an idea, my Crab Mecha in minifig scale, but nothing assembled at the moment. So I've really got to get on the stick about that. This brings me to another point, is there any way we could get the guys from the Transit Gate to PAX East next year? Or No B.S., Just ABS? I'd love to do a "blogger's symposium" or a "State of the Nation for MFZ" panel next year. I have a whole bunch of ideas for next year. I've talked to Joshua about a few things too. I'll spell them out over time and hopefully build up a groundswell of attendance for next year. 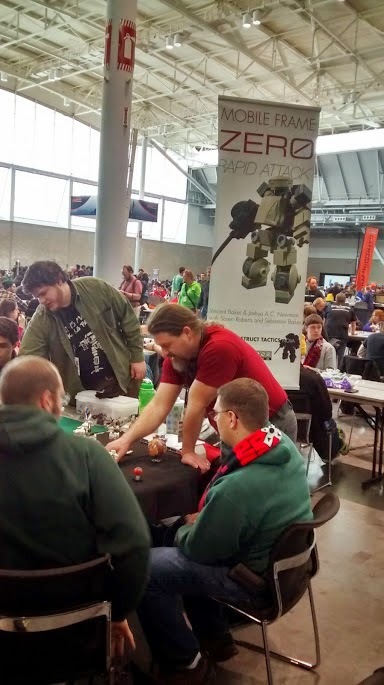 Since our MFZ group hadn't had a game since late 2014, and we were all going to be attending PAX East, we decided to get together and have a game on the last day of the con. Initially it seemed we were going to end up with an eight player game -- the initial group plus friends and a few others -- but it ended up being only six. The regular group -- Tom, Grafvonbarnez, Stevenik, and me -- was joind by Bassclef and Vlad. 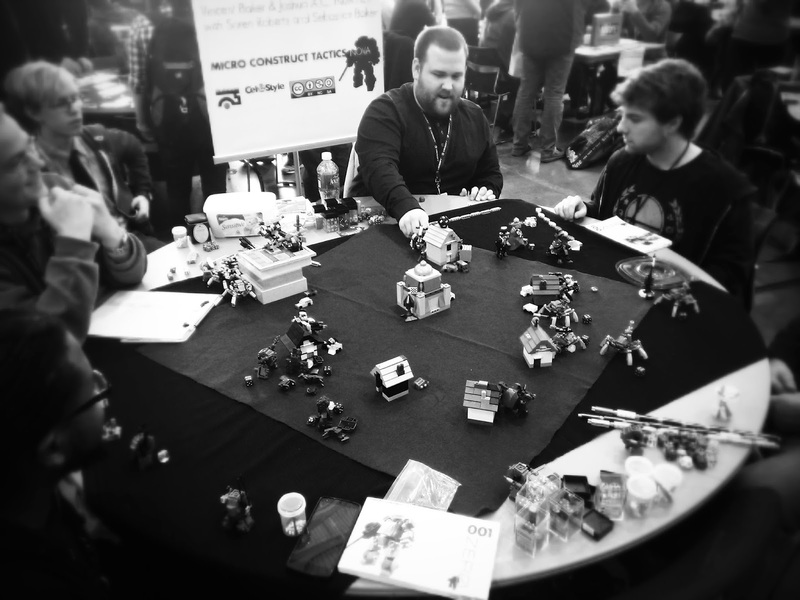 We all showed up at the MFZ demo table at 1:00 pm, broke out our squads, stations, and terrain, and prepared to do battle. Note 1: There was so much going on , and I was talking to passers-by about the game, that I can't really relate what everyone else at the table was doing. So this battle report is going to be relatively one-sided. I'll tell you what my thoughts and plans were as the game progressed. I'll also be relying on the notes Tom took. Hopefully the other players can chime in with other things that happened. Stevenik (4 frames & 16 systems) = (5 points per asset) * (5 assets) = 25 points. Grafvonbarnez (4 frames & 16 systems) = (5 points per asset) * (5 assets) = 25 points. Bassclef (3 frames & 12 systems) = (6 points per asset) * (4 assets) = 24 points. Tom (5 frames & 20 systems) = (3 points per asset) * (6 assets) = 18 points. Vlad (5 frames & 20 systems) = (3 points per asset) * (6 assets) = 18 points. Note 2: All of the pictures are from my cell phone as the batteries died in my regular camera and I didn't have any spares. My station is in the middle of the battlefield -- undefended -- next to the mosque with everyone else arrayed around the perimeter I set up. I knew I had a target on my back from the minute the game started so I kept passing and pushing everyone else to make a move. Grafvonbarnez actually had the closest mech to any of mine so I waited until he activated that one then I made a play for Vlad's station. 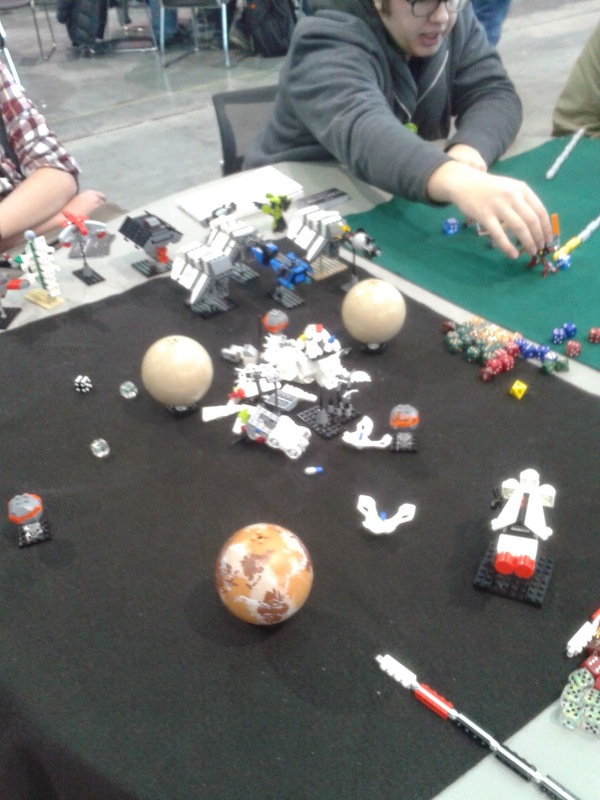 At that point all hell broke loose and two of my mechs got pounded down to white dice. No stations are taken and no mechs are destroyed. I think around this time Blorf from the Hangar showed up. I started talking to him, Joshua, and my friend Ron in an attempt to fade into the background a little in hopes people would forget about me and my mechs. 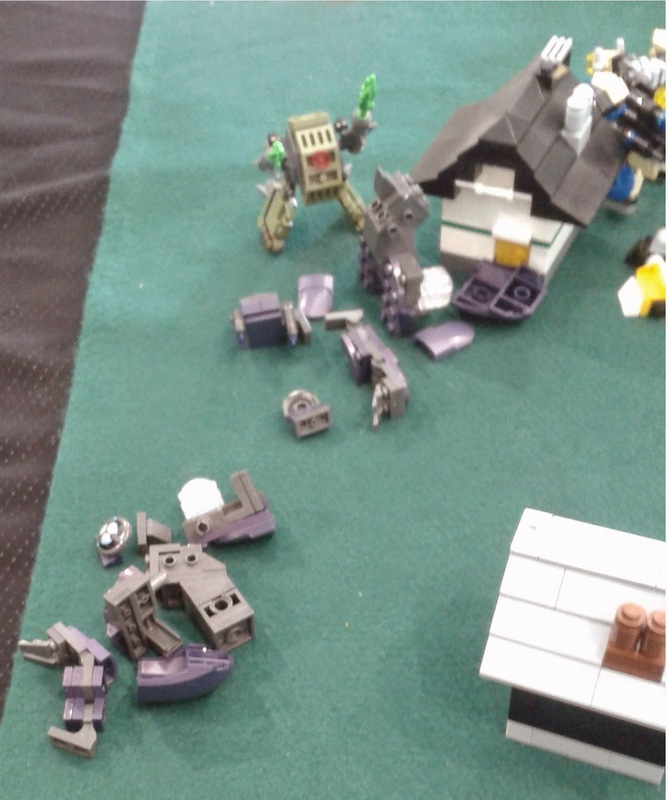 Unfortunately I lose a mech, which was the first blood on the field. Grafvonbarnez grabs my Station but loses his to Tom in the process. He also exchanges a lot of fire with Rob, losing two mechs. Stevenik exchanges fire with Rob as well. I make a few random moves with my remaining mechs. Stevenik's mech has the power of Jeezus. Stevenik grabbed my station that was under Grafvonbarnez's control but lost one of his mechs along the way. I snag it back with my one undamaged mech. The other sprints to take Vlad's station but falls one unit short. Vlad eventually kills this mech. He also kills one of Tom's out of "spite". 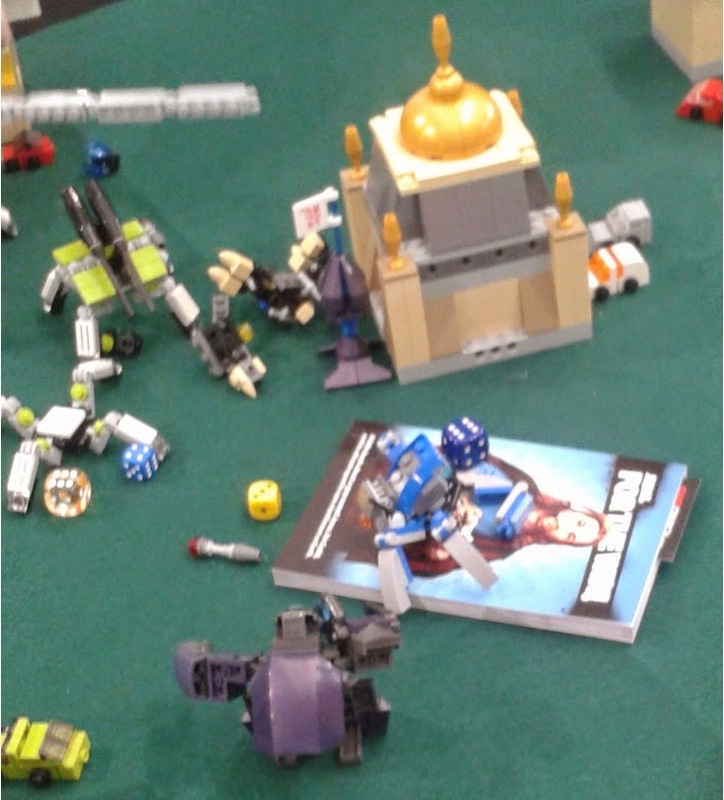 :-) Stevenik loses another mech to Tom. Prior to this it had withstood three different attacks. Stevenik went so far as to declare it was protected by God and laid down one of the strange bibles that a booth had been giving out. You really had to be there. :-) Grafvonbarnez, in a brilliant move, recaptures his station that Tom left undefended. 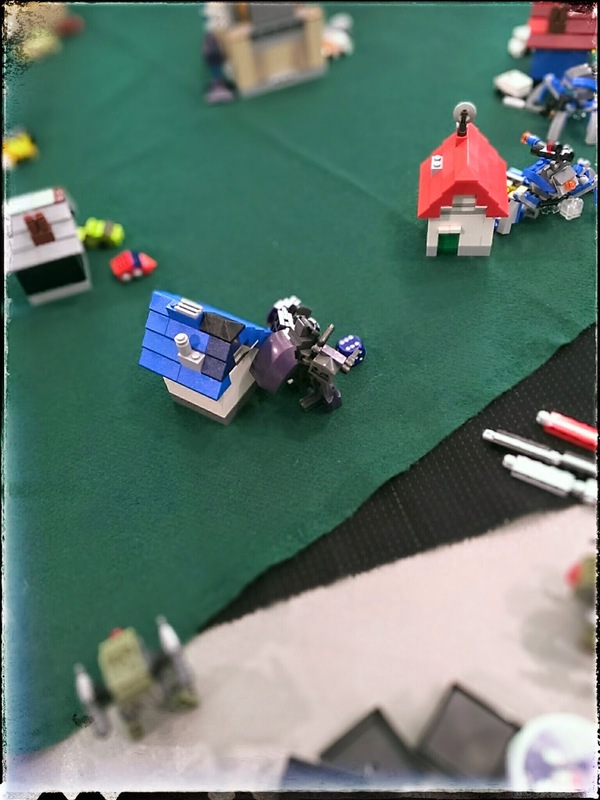 Rob loses two mechs and his station to Grafvonbarnez. At this point everyone had activated and the DoomsDay Clock clicks down to zero. A six player game is a lot of fun, but also a lot of work. We drew a lot of attention from people walking by. 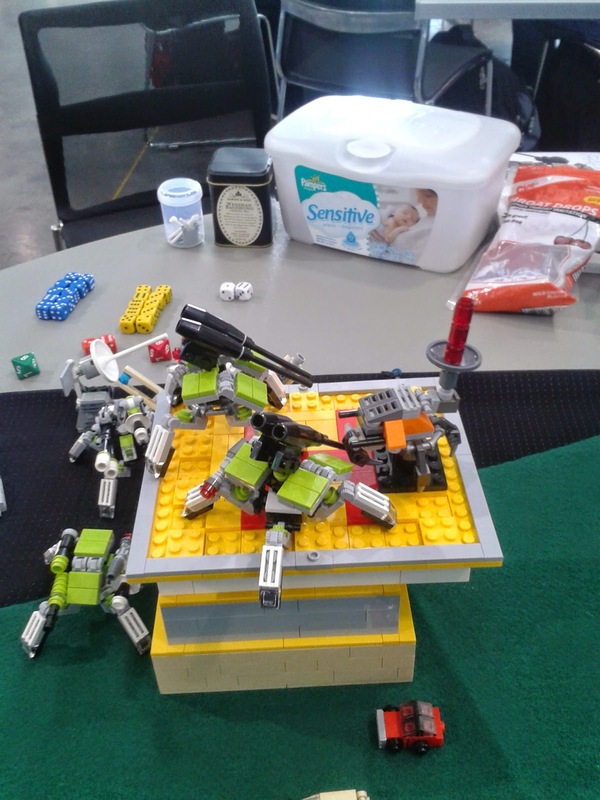 This was Vlad's first full scale game. Awesome, right? When the opportunity comes to drop a Ranged Weapon and go for the Sprint die when you have to move fast, take it. There were a lot of decision points in the game and a few woulda, coulda, shouldas, but the above point is my one big mistake and regret from this game. Hopefully we can get another game in some time soon. Now comes the part you've all been waiting for, the pictures! and SteveNik for letting me use their pictures. 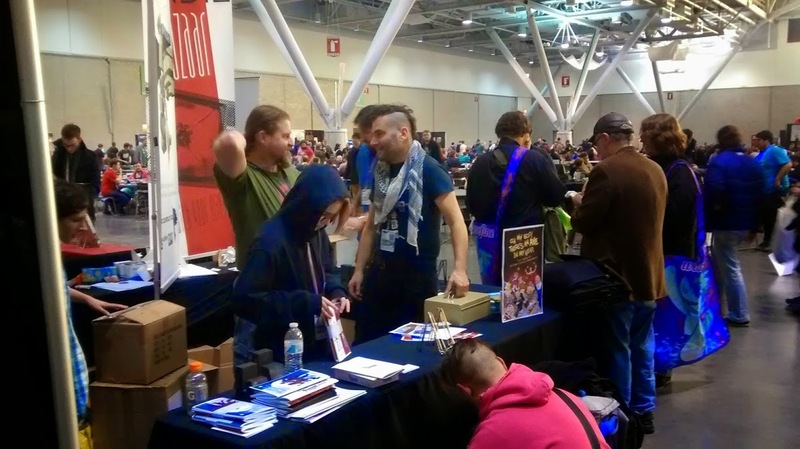 I've also put together a few Flickr galleries for this and past PAX East conventions. 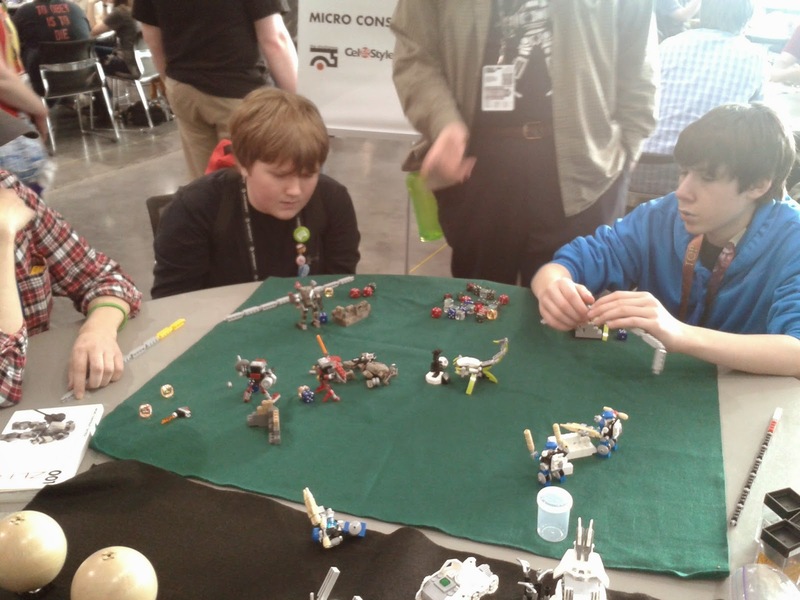 PAX East 2012 Gallery. 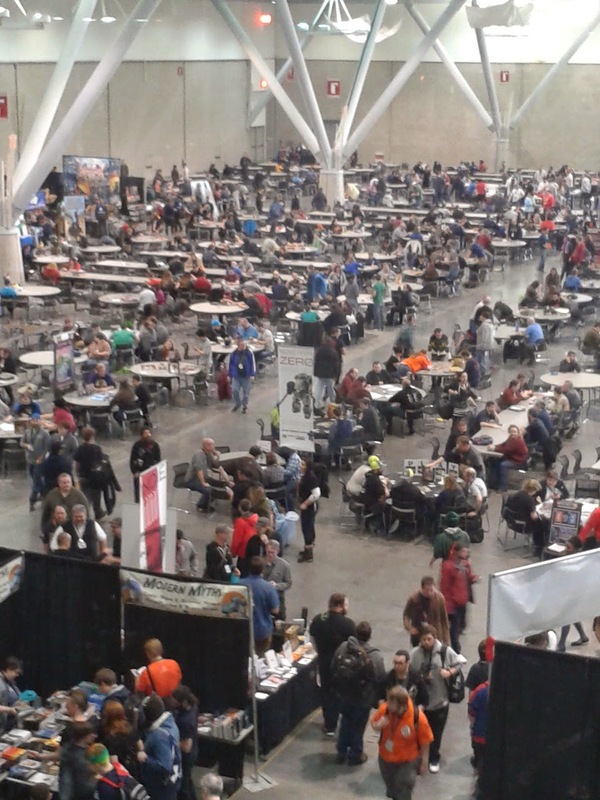 PAX East 2014. 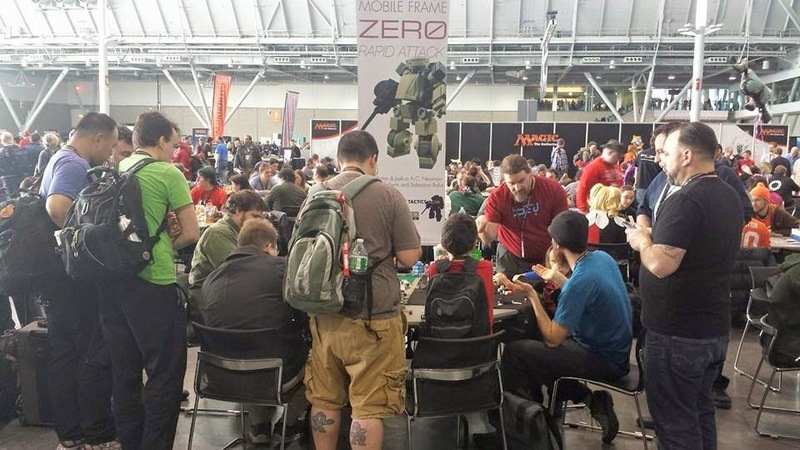 PAX East 2015. Dark Cloud Blogs already posted this on Facebook and Google Plus but I figured I'd a little wrinkle to it. Toys'R'Us is advertising 20% off on Disney Princess, City, and Minecraft sets. But if you click through the link you'll see there are also some Star Wars sets on sale too. Interesting. This sale stacks with the $5 off $25 Lego purchase coupon that expires today. One of my local TRUs also has some interesting Clearance finds. 70132 Scorm's Scorpion Stinger for $29.98, 70131 Rogon's Rock Flinger for $24.98, 70704 Vermin Vaporizer for $59.98, 70700 Space Swarmer for $5.98, 70400 Forest Ambush for $7.98, 70402 The Gatehouse Raid for $19.98, 70706 Crater Creeper for $5.98, and 70702 Warp Stinger for $24.98. So you might want to check yours out, YMMV and all that. I have some actual observations from this year but, I'm also going to look back at last year's and see what I managed to change. 1.) I gave out business cards this year, about 100 of them. 2.) Thanks to Mike Raichelson for getting me three MFZ shirts before the con after I ordered them at the last minute. Outstanding customer service, check out his website Mobilfra.me. 3.) I managed to take a day off and wander around the con. Still kind of aimlessly and I still didn't manage to play any games. 4.) My voice only got really rough on Friday evening. Luckily we had a supply of throat lozenges for the weekend. 5.) 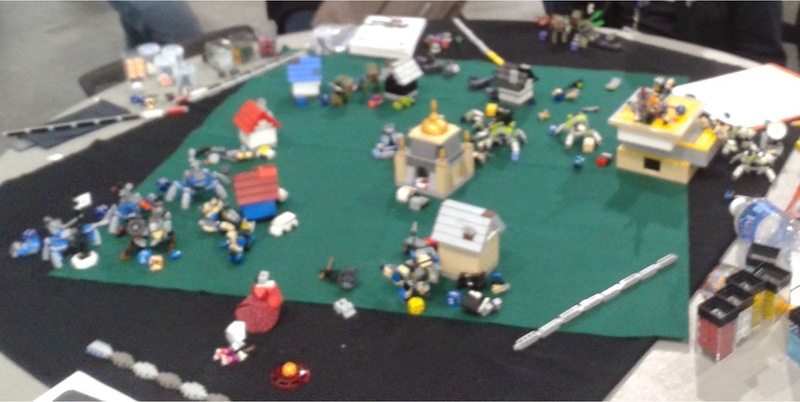 We managed to get in a full game of MFZ on Sunday. Passers-by seemed suitably impressed. 6.) 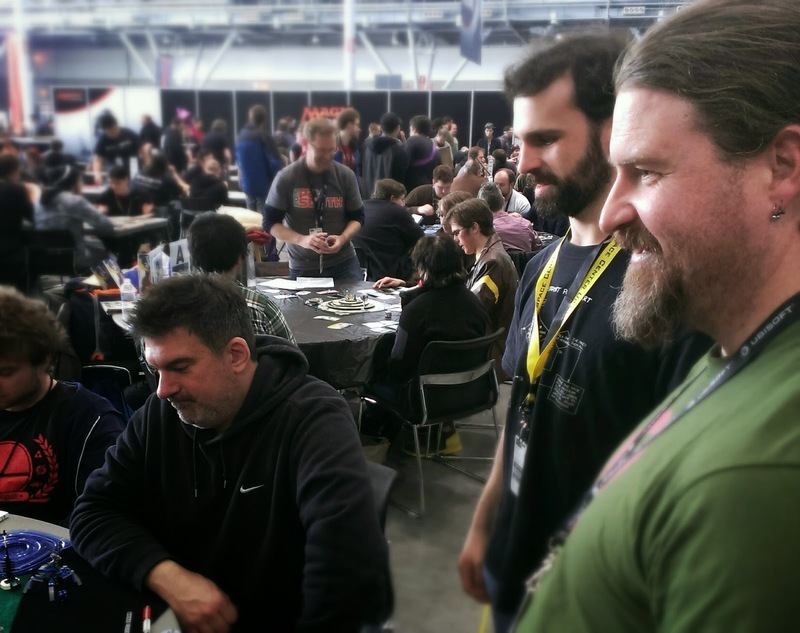 I didn't do much demoing of Intercept Orbit this year. 7.) I managed to get a new set of dice for MFZ this year after talking about it for the last three. 8.) I'm need to rethink the contents of my demo bag. 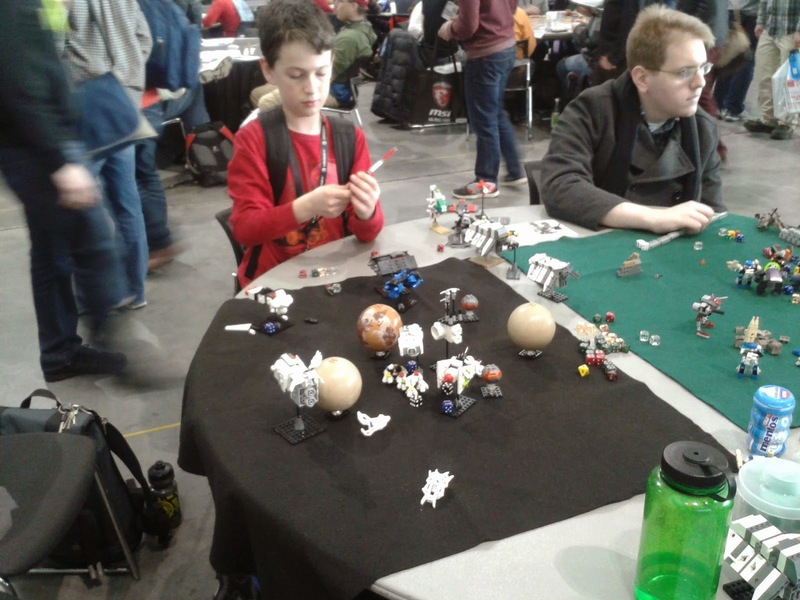 It's great for playing a whole game, but lugging that much plastic to and from the con is taxing. 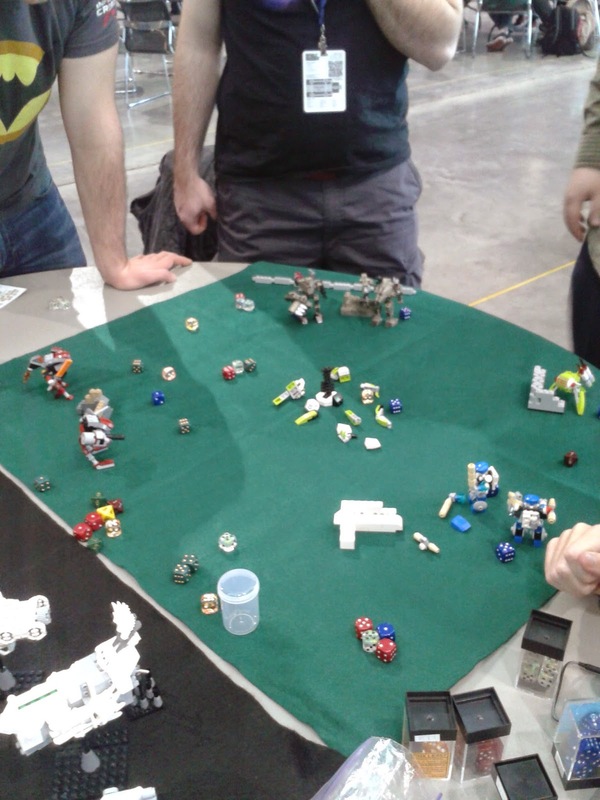 8.1) I think my demo bag next year will be teams of canon frames, walls, felt drop-cloths, and dice. 9.) Coming down from the con is tough, even with a day off. 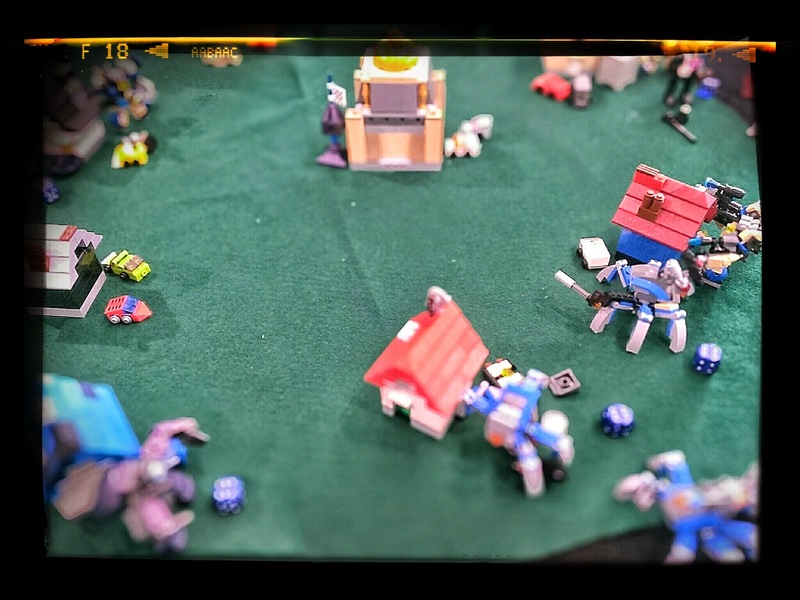 All I want to is talk about the con and MFZ. 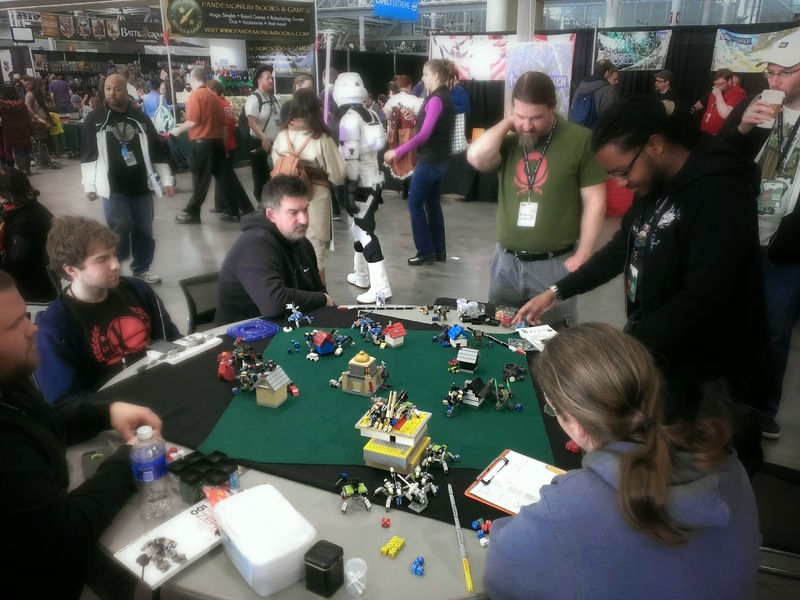 I spent Monday scouring the net for any mention or picture of something that happened at the demo table. 10.) I didn't manage to arrange dinner plans with anyone this year, except for my traditional end-of-con dinner at No Name Seafood with my wife. Next year! 11.) I managed to spend most of Sunday walking around and experiencing the con with friends. Next year, more of us! 12.) I didn't get my panel submission accepted this year, but I have more -- and better -- ideas for next year. 13.) My friend Ron came up with a great idea for little "care packages". 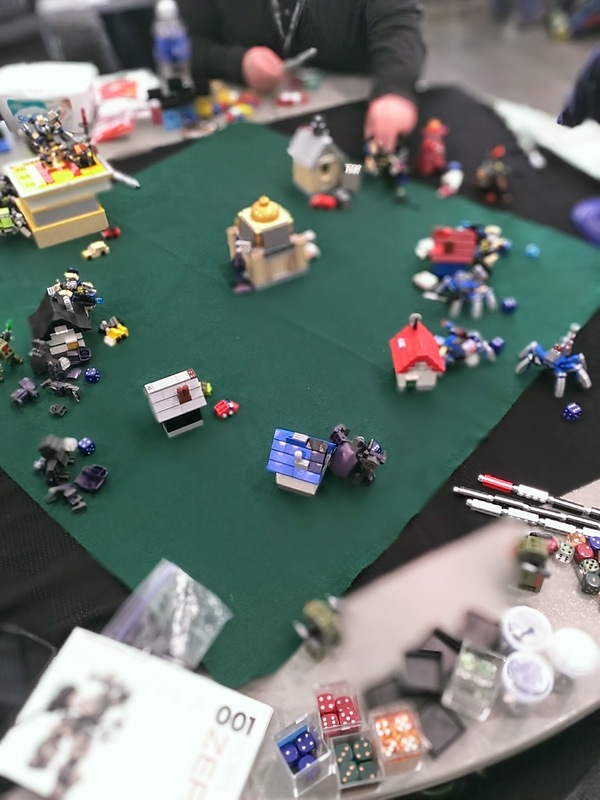 Anyone who plays a demo gets a little baggie with a business card, Lego brick, and a six-sided die. I'll try and implement that next year. 14.) Next year, stay properly caffeinated. I think this is what led to my headache on Saturday. 15.) Next year, I'm thinking about having Friday be my "me" day. The crowds are slightly less and there's less impetus to "get it all in" before the con closes. 16.) I have a bunch of ideas and plans for next year. I'll discuss those in a "Road to PAX East 2016" post. 17.) Get a bunch of business cards from Mike Raichelson for his website Mobilfra.me to hand out as I spent a lot of time talking about it. 18.) I still want a MFZ hockey jersey. 19.) As always, it was great to see everyone, all the friends I've made because of the con and my friends from outside the con. I'm back from PAX East. Only a semi-wonderful time as I had a bad headache on Saturday. 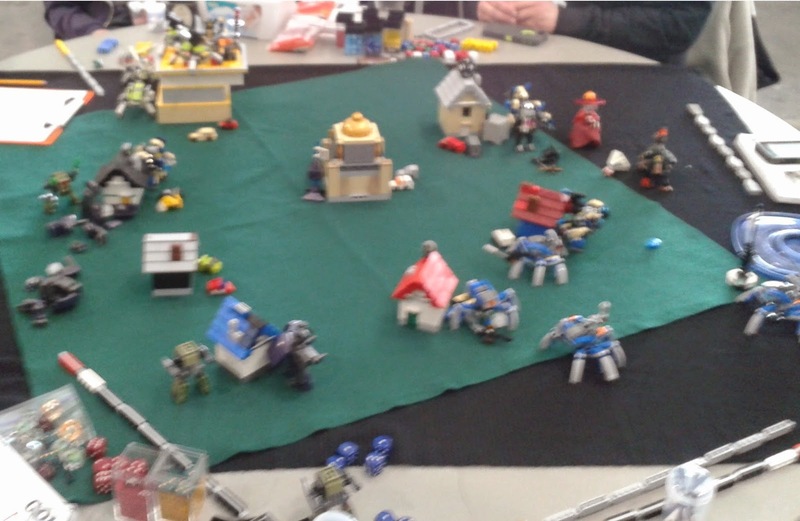 Although the six player game of MFZ on Sunday kinda made up for it. I managed to get in early on Friday which was nice as it gave me and one of the other guys that was helping demo time to set up the table. 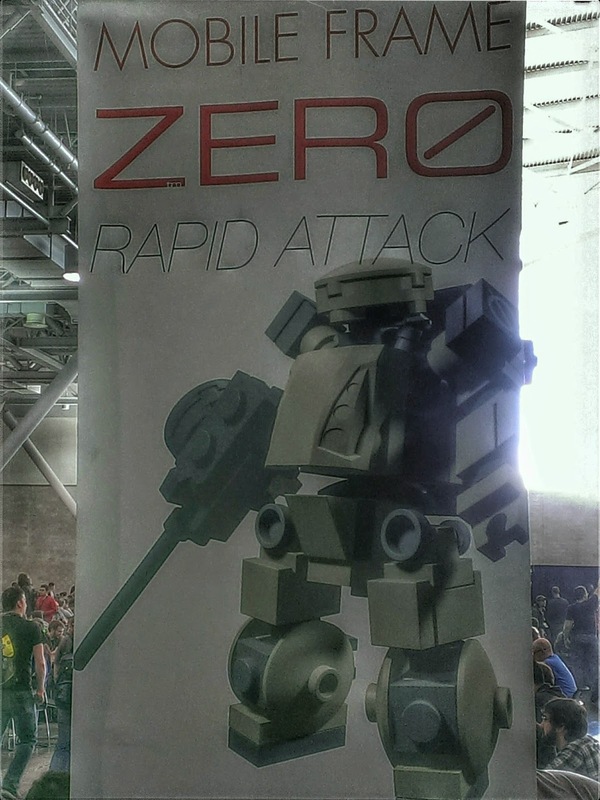 I ended up demoing MFZ: Rapid Attack at least fire times and MFZ: Intercept Orbit twice. I actually saw a RA team with Artillery win the demo game twice! We also had two one-shot kills in two different games -- one RA the other IO. I stopped demoing around 6:30 pm as my voice had taken a bit of a beating during the first IO demo. Saturday didn't start out so well. I woke up with a bad headache that would not go away all day. I got in a little late after the con floor opened, 10:30 am. I managed to run three IO demos, and one RA demo -- although it could have been more. The first IO demo featured a Ram Attack that ended up destroying both ships. The board looked like an interstellar junkyard by the end of the game. My last IO demo was for Golden Meanie from the Hangar and his two sons. Vlad and Ryan also stopped by the table to say "hi". I quit around 4:00 and decided to go home. Sunday was my day to enjoy the con so I wandered around with a friend for most of the day checking out the computer gaming end of the hall as I don't really spend much time there during PAX East. I did run one demo of RA though. Which I did right before the big event of the day. 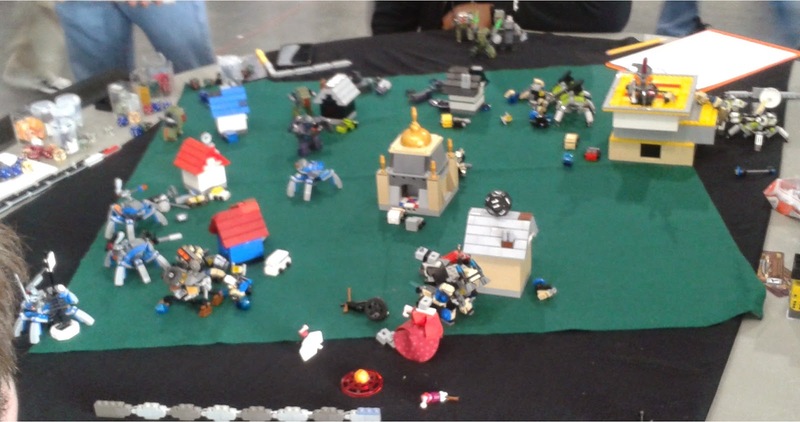 My local MFZ gaming group all had tickets for Sunday, so we got together and played a game right there at the con. Vlad from New Jersey, whom I've mentioned before on this blog, and Rob joined in to make it a six player game. From us sitting down at the table to me putting the final pieces back in my travel bag it ran four hours, 1pm to 5pm. It was a blast. The lead see-sawed around the table, alliances were made and shattered, and fun was had by all. I've already discovered four pictures from the game on Flickr. My friend Ron, who was observing, took a bunch and I know the other players did too. Hopefully I'll have a battle report done by the end of the week. I met a lot of people, some for the first time, others again. I'm horrible with names so I'm not going to try and make any shout-outs other than the ones I've already done. It was great seeing all the friends I've made through the con again and I look forward to next year. The are a couple things in the works for next year but I'll talk about that later. 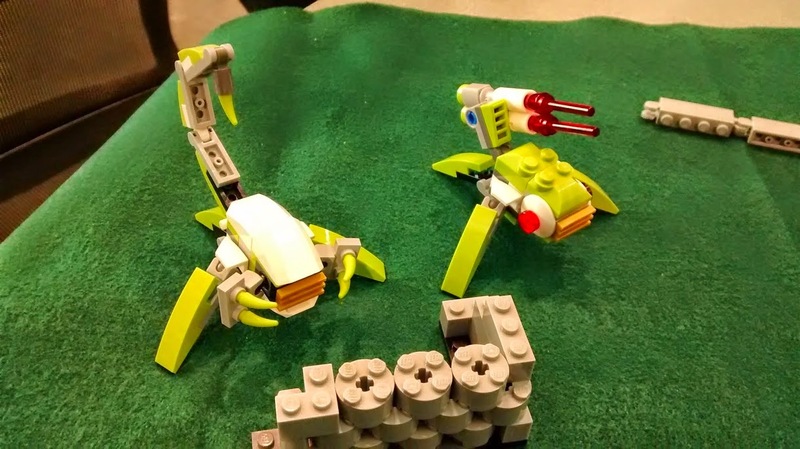 A while back I created my first all Kre-O frame called the Bullfrog. There were some minor problems with it, like the Clip Tiles that held the legs on being very loose on the Bar Plate they attached to. While it was nice that the initial frame design was a 99% SSC in the long run I wanted something I could field in a game. I also wanted to maintain its pure Kre-O nature. Over time I collected more sets and pieces and was able to replace the Clip Tiles with better versions. I tweaked the design a little and made a squad of them. In the front is the Close Combat model (2Rh+d8/Gd8/2Y/2W). On the sides are two copies of the Dual Ranged Hitter model (2Rd/2Ra/1Y/2W). In the back is the Heavy Hitter model (2Rd+d8/1Y/2W). I also have another Bullfrog partially assembled. I'm not sure what range I'm going to assign it to. that the squad is equipped with a full set of SSRs. this squad, which are pure Kre-O. Hopefully I'll have the chance to put them through their paces at PAX East this year.